The other night, I was watching tv and got a phone call and went to hit pause on the remote, but it just kept playing. I had to be more intentional to make sure I hit that little button in the right spot on the remote before the tv show actually paused. Sometimes life is like that. We need to pay extra attention and hit "pause". We need to be intentional about taking time to notice things around us. It could be for a few minutes, hours, a day or maybe a weekend. For me, weekends, are a time I can usually step away from the busy-ness and business of the week and reconnect with God and my family. This past weekend both of our daughters were home! We had a great time together; playing cards and just enjoying each others company. We paused. 1 God of Heaven’s Armies, you find so much beauty in your people! They’re like lovely sanctuaries of your presence. desires and daydreams of living in union with you. my true source and spring of life! among your altars for the birds to raise their young. enjoying you as they worship in your presence! and the God of all gods will appear before them in Zion. 8 Hear my cry, O God of Heaven’s Armies! God of Jacob, listen to my loving prayer. 9 God, your wrap-around presence is our defense. In your kindness look upon the faces of your anointed ones. a thousand days of joy rolled into one! in the most beautiful palace of the wicked. 11 For the Lord God is brighter than the brilliance of a sunrise! he is so generous with his gifts of grace and glory. will never lack one thing they need, for he provides it all! what euphoria fills those who forever trust in you! 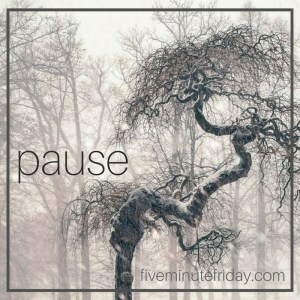 How can you pause in your busy day today?